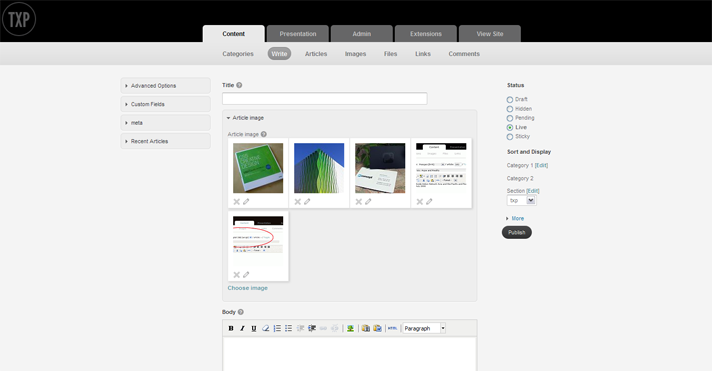 This plugin allows to upload, edit and show article images within the ‘write’ tab. 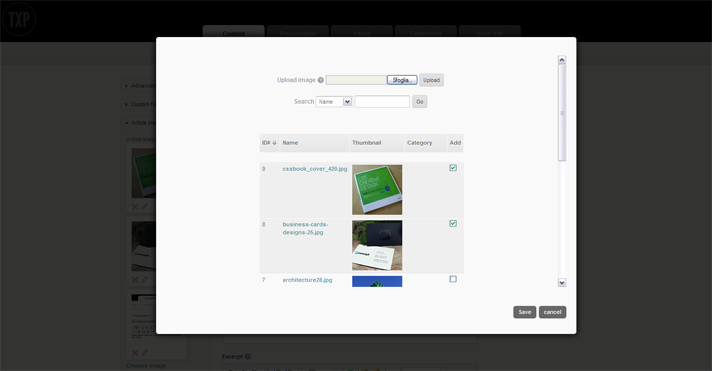 Similar in concept to my other plugin bot_file_upload it uses a modal window to add and edit images. 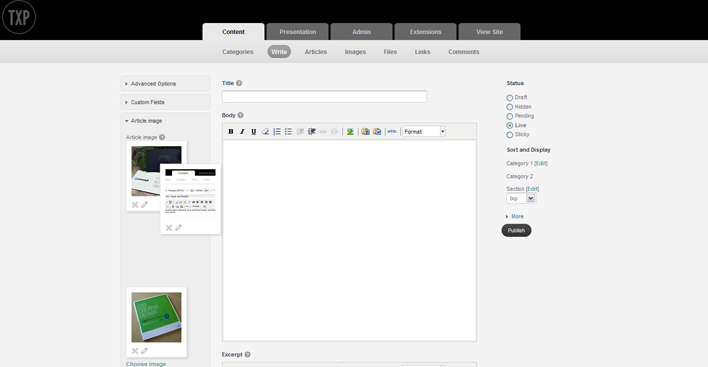 Moreover it shows a preview of the article image directly in the ‘write’ tab thus incorporating someway my old plugin ‘bot_show_image’. The plugin does not alter texpattern natural behavieur, it just operates at a visual level hiding the field and replacing it with an interface. Under the skin, images are still stored normally as comma separated values. The plugin has no configuration interface. If you want to change some settings you can easily edit them directly in the plugins code. Go to plugins > edit and search for ‘Global preferences – Configuration’ in the first lines. Read instructions for more help. 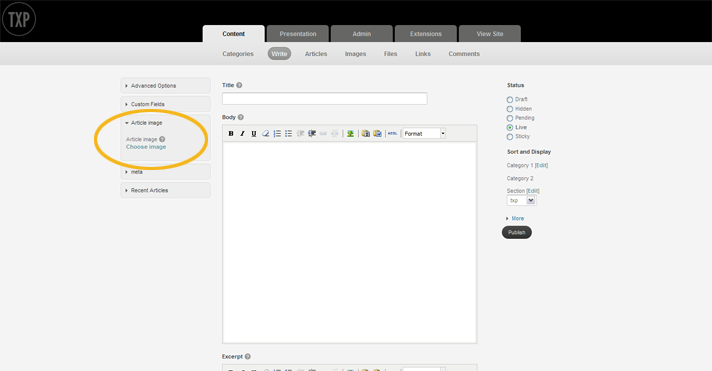 Multiple fields ("article image" or any other custom field) can be set for the plugin to operate. Set the "article image" field to accept only one image, custom field 2 to accept a list of them for a gallery, custom field 3 for another gallery and so on. Of course replace 'article_image' with the custom field name if you are using one. improvement - addressed issue with different number of columns depending on the number of authors and privileges (thanks Jukka) . did you install the right version (0.6.3)? It seems to work for me. What problems are you experiencing? Will you be updating these plugins to work with Textpattern 4.5.0? with the just released txp 4.5.0 your plugin is not working anymore, as well as your bot_file_upload plugin. I am sure you will have some spare time to look into the matter and update your plugins, since they are both very useful. Can you please look at it?! glad you find it useful. Anyway – regarding your request – that’s a good catch, I didn’t even consider this issue. So thank you, that’s another thing to add on the todo list for the next release. I love so much this plugin. The only one thing I don’t like is when you delete the images from DB, you can’t delete these ID missed images in the custom field. Happens the same with ‘bot_file_upload’. But, I guess it very difficult find a solution. Anyway, I’m a big fan of your work. Thanks! Silly me – I hadn’t enabled thumbnails. I removed the “files” custom field and re-added it, and now both plugins are working. Great work – fantastic plugins! the plugin is actually intended to show thumbnails so I suppose either your images don’t have a thumbnail (check it when you upload them) or there is another issue which I can’t imagine now. Regarding bot_file_upload compatibility this is strange, the two should work well together (I use them together all the way). I need more infos to help with this. As a start is the js code output in your “write” tab html source” (search the code for “bot_file_upload”)? I love this plugin. Is there any way to make the drag and drop image sort feature in the sidebar show thumbnails instead of full sized images? It’s pretty unwieldy right now, as the full image is appearing on the page. Also, I’d ideally like to use this with your file upload plugin as well, but they don’t appear to be playing well together. Is there anything I need to do to ensure they work together? Thank you superfly you are right: this is a bug. I’ll fix it in the next release when I’ll find some free time ok? Thank you again. Thanks for the nice Plugin! But when I hit the save/cancel Button the sortable ability from the UL list is gone. To fix this Bug I added the sortable Function to the Edit/Cancel Click Function. To start the sortable Feature from the iFrame jQuery needs a Parameter for the selector. Great plugin – thank you! One thing I’m not sure about is how to define a custom field in the prefs (I’m using glz_custom_fields BTW) – do I enter <txp:custom_field name=“background” /> or <txp:custom_1 /> or <txp:custom_1_set />? None of these seem to work – any advice welcomed. Thanks again. Ciao, actually it’s an home made (css only) theme I use for myself. If you want to download it I’ll post it in this site as I have some free time in the next days. 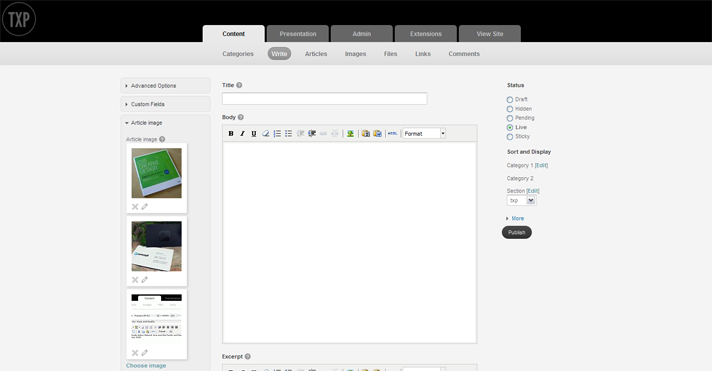 Ciao Luca, which admin theme is the one in screenshots? Btw, thanks a lot for the great work. It can work with txp 4.3, can you give the code new update? Thank you very much for bot_image_upload!